Hope Schreiber Photography - beautiful nature photography! I have been using Squarespace for my own website and to create websites for two fellow photographers. I offer this as a service now, in a narrow case – for anyone who wants to use Squarespace to make a simple photography website. Besides my own site, check out the two I helped with – www.aopp.photos and www.hopeschreiberphotography.com to see the beautiful work of these two Newton Camera Club members who are talented, artistic photographers. Hope Schreiber takes amazing nature photographs. You may have caught her exhibit a few years ago of her ammonite photography at the Newton Free Library. She has been collecting ammonites to photograph for many years, pulling the most beautiful details and colors from these fossils. She has also traveled to Costa Rica and the Pantanal where she has photographed amazing wildlife. Her images are always so sharp that you almost feel you are right there. But most spectacular are her photographs of bats in Arizona - in flight! Congratulations to Hope on her two photos selected for NANPA’s Top 100!! In October 2017, I had an exciting two-day shoot with PCA in North Conway, NH. Working closely with PCA’s Marketing Director, I photographed the renovations of the existing Settler’s Green shopping complex, the new shopping area called Streetside, and three restaurants, Barley & Salt (shown below), Wicked Fresh Burgers, and White Mountain Cupcakery. We went to each area multiple times, catching the light as it changed and including people or shooting a space, so that we had a lot of options when selecting photos to use. Barley & Salt has a beautiful combination of wood and tile. Sometimes people from my client’s office serve as models, sometimes we shoot spaces empty, and sometimes we just catch the people who happen to be there at the time (usually blurred as they move through the space or move their heads). Conveniently, the hotel I stayed in was just across the street, so I could come and go for dusk and dawn. And I can attest to the great food at these places! It is a new experience to eat dinner at places I'm photographing. Some storefronts were not yet occupied, but at night, the exterior lighting made it all come alive. 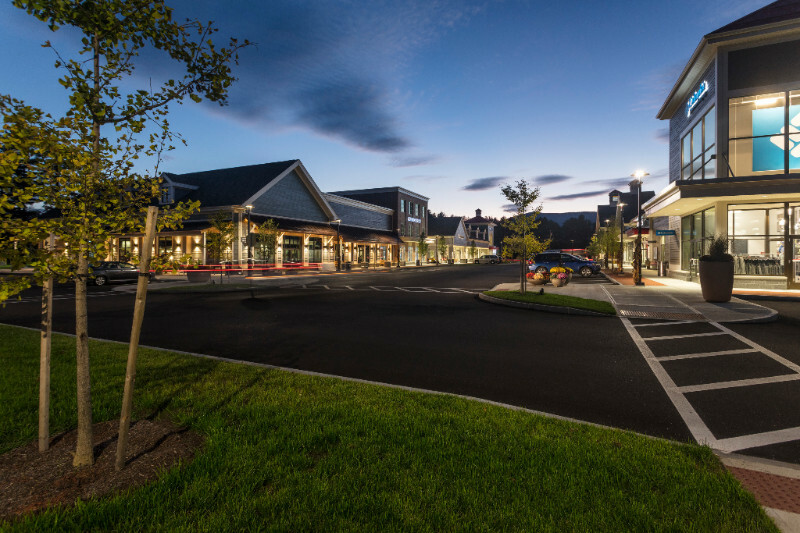 Photo shoots can’t always be timed to happen when conditions are perfect – this area needed to be photographed in the fall while the grass and trees still looked good, even though not all the retailers had moved in and the shoppers were still learning about the new stores. At Wicked Fresh, the burger place, I loved the way the words on the windows created shadows on the wall and floor, adding a text dimension to an architectural shot. The red accents of the chairs and the napkin dispensers, as well as the umbrellas outside, provided a way to tie the image together. 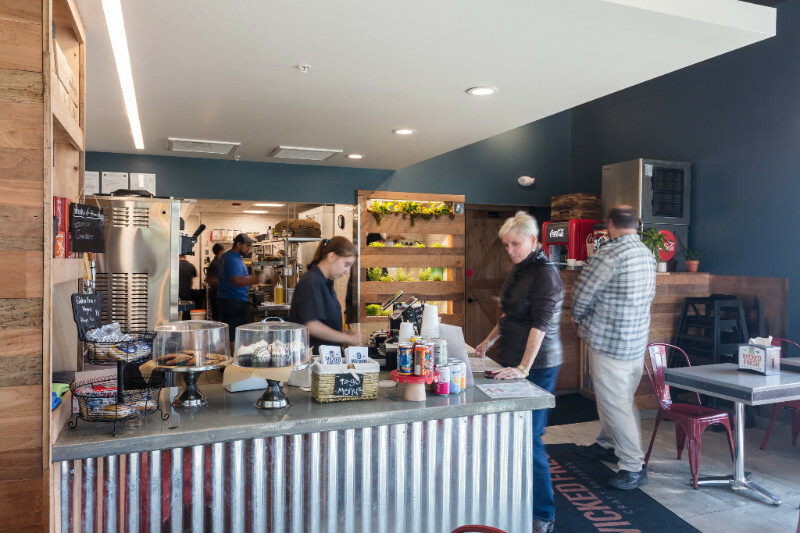 Wicked Fresh had a great combination of corrugated metal and wood, and included a garden of house-grown herbs which you can see on the back wall past the counter in the image below. This shoot was exciting because there was so much to cover, but we needed to capture it in just a few images for the architects’ website and proposals. I enjoy the challenge of giving a feel for the place and a sense of the design through the photographs. The more my client can tell me about the story of the design and construction, the better I can show their work in a way that tells that story. Elisif Photography provides high quality architectural photography to companies in the building industry, including architects, builders, developers, commercial and residential real estate brokers, interior designers, interior decorators, remodelers, and more. Photo Tip of the Month: What Time of Day to Go? How do you find the best light for photographing a building or waterfall or other site? I have three iPhone apps I can recommend: LightTrac, Golden Hour, and Sun Surveyor. These apps can help you figure out the best light for a given location on a given day. LightTrac shows you the direction of the sunlight overlaid on a satellite view of the place you want to shoot. It gives you the angle above the ground as well, so you can tell when the sun will rise above a building that may be across the street from one you want to shoot. The app Golden Hour gives you the times of sunrise, sunset, golden hour, and blue hour – it can help you decide when to go to get that magic blue sky. Sun Surveyor gives you augmented reality projections over a live camera view and a map with street view, as well as providing information about the position of moon and the Milky Way, which is great for night shots. I use these apps not only for photo shoots for clients, but also for trips abroad such as my trip to Italy last year, so I could take light into account in planning my itinerary (weather permitting of course). Is the place clean and tidy? Are all the lightbulbs working and can they be turned on? Thinking ahead about these details can make the results much better, and avoid last-minute surprises or retouching to be done. Lately I’ve been expanding my social media outreach to include Instagram, and since it is a photo-based platform, I’ve been loving it. Please check out my Instagram feed @elisifphotography. I found lots of people to follow and the more people I follow, the more follow me. I've tried to find the Instagram accounts of companies in the building industry in the area, and follow them so they might notice me. In learning more about Instagram and hashtags, I found out it is best to put the hashtags in a comment, rather in the description of the photo - so that way they are less in the way, but still searchable. If you search for various hashtags, you can find out what other people are using, and use those same ones. One recommendation was to put about 20 hashtags on each post. You use general hashtags (#architecture, #photography), specific hashtags for your geographic location (#bostonarchitecture, etc. ), and hashtags specific to the photo you are posting (#kitchen, #modernarchitecture). Are you on Instagram? What do you like/dislike about it? Have you found interesting people to follow? This photo was taken at Logan Airport, at the Legal Seafood restaurant in Terminal C. Prellwitz Chilinski Associates, also known as PCA, hired me to shoot this restaurant after they designed it. As you can see, they were going for an atmosphere of being under the sea, with light from above. The ceiling light evokes bubbles rising to the surface. It was interesting doing a photo shoot inside security at the airport. Since we didn’t have plane tickets, we had to go a day in advance to the main security office of the airport, where they did a background check and reviewed our IDs. Then we had to go back for the shoot at nearly 11pm so we could take photos right after the last customers left. The interior designer and I spent a lot of time getting the placemats and napkins and chairs lined up just right! You can see from the pattern that even one thing out of place would be very noticeable.